Ralph Breaks the Internet is an insanely ambitious movie. It is jam-packed with fascinating ideas and important themes to go along with all the humour, heart, and excitement one would expect from a Disney Animation film. For the most part, that ambition adds to the film, providing it with memorable scenes, emotional heft, and timeliness. Other times, though, it can hold it back a bit – if only because balancing and weaving all those pieces together can feel a little forced. Set six years after the 2012 film Wreck-It Ralph, Ralph Breaks the Internet picks up with Ralph (John C. Reilly) and Vanellope (Sarah Silverman) living their best lives in their arcade. They play games all day, drink root beer all night, and debate if there’s more to life. Things then take a turn when Vanellope’s arcade game breaks, forcing the pair to find a missing part so she won’t be removed from the arcade forever. Where would one go to get an ultra-rare part for an outdated video game? The internet, of course! Ralph and Vanellope travel to through the arcade’s wifi, but this isn’t just some normal internet. This is a fully realised embodiment of the internet, a place where users are represented in the form of little avatars, websites are giant buildings, search engines are adorable creatures, pop-up ads are street performers, and a pair of video game characters can try to save an old arcade game by finding a rare item. Once Ralph and Vanellope arrive in the internet and dig deeper and deeper into the landscape, they begin to question their own lives and how happy they actually are in them. 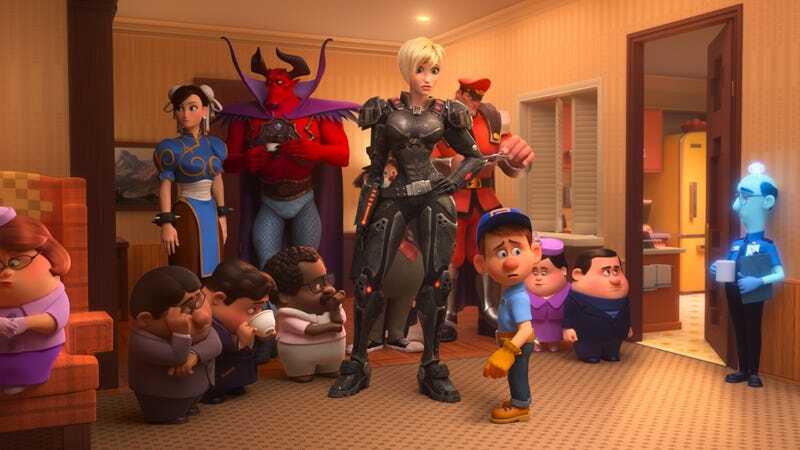 Felix, Calhoun, and the other stars of the first Wreck-It Ralph are here, but they have limited roles. While those existential questions are key components in the film, the best part of Ralph Breaks the Internet is the internet itself. Each time the characters visit somewhere new, it’s like opening a present. The film constantly surprises the audience with unique spins on familiar internet tropes and famous sites and pushes the story into new and unexpected places. Places like “Slaughter Race,” an online racing game slash Grand Theft Auto hybrid, where the evil racer Shank (played by Wonder Woman herself, Gal Gadot) resides. After an encounter with Shank, Ralph and Vanellope end up at BuzzTube, a YouTube/Buzzfeed mashup where a character named Yesss (Taraji P. Henson) continues to help the pair on their quest. From there, the film pushes forward at a breakneck pace, as Ralph and Vanellope jump from site to site, solving problem after problem. And honestly, almost all of it is pure gold. Each individual scene, whether it’s a huge chase scene, a big musical number, or the highly-anticipated Disney Princess scene, works beautifully. It’s a cacophony of set pieces that are each thoroughly entertaining and engaging. Plus, each of these scenes is layered. There’s the main focus, several things happening right to the side, and then dozens of things in the background. This can run the gamut from cameos and references to themed music, various types of memes, trips to the good parts of the internet like fan sites, the bad parts like comments sections, and so much more. Much like the internet itself, you can easily get lost in every manic, magnificent place. Shank and her crew in Slaughter Race provide Ralph and Vanellope with a crucial clue. While those weak connections definitely hold the film back a little, the good stuff is so good, it’s hard to feel too disappointed. Plus, one connection does weave its way through the film better than the rest. It’s Ralph and Vanellope’s complex friendship, which doesn’t just get tested throughout the film, but evolves and gives the story some real poignancy. Their relationship ends up tying the whole film together in a way that’s sure to tug at your heartstrings, but also get your brain working as it touches on a slew of complex subtexts such as toxic fandom, male privilege, mental health, and more, which is unexpected but certainly welcome. 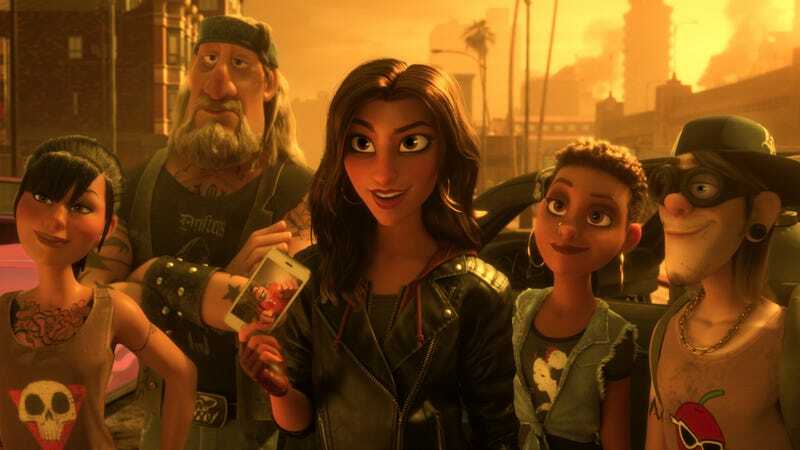 In the end, Ralph Breaks the Internet is a sequel equal to its predecessor. It doesn’t quite pass it by, and there are flaws to be sure, but it’s so full of amazing scenes, thoughts, and visuals that a few weak pieces of connective tissue don’t hold it back from working its wonders.